Every kitchen needs a good pair of shears. I probably don't reach for mine as often as I do a chef's knife or kitchen scale, but it's a closer race than one might think. Sure, I use them for cooking-related tasks—any good pair should obviously excel in that area—but they do so much more. The kitchen is a center of activity in my home, as, I'm sure, it is in yours. That means I grab my kitchen shears for just about everything. I open packaging with them (whether that's a block of vacuum-sealed rice, a new piece of cooking gear in one of those annoying bombproof plastic shells, or the latest delivery from Amazon). I break down boxes. I cut parchment paper, open airtight bags of coffee beans, and snip the backbones out of chickens. If I need a pair of shears for anything, chances are my kitchen shears are the ones I'm going to use. They're so important in my daily life that I keep them suspended from a hook on a rail in my kitchen. You know what else gets a priority position on that rail? My bottle openers. People put bottle openers on their keychains. That's really important. Given how much of a workout a pair of kitchen shears can get, it helps to know which are the best. I put 12 of the top-rated pairs to the test, running them through a sequence of tasks to find the ones that aced them all. 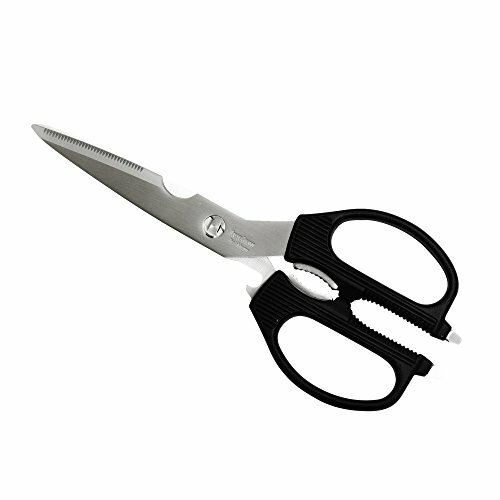 Kershaw's Taskmaster Shears set the bar for excellent heavy-duty scissors. They're strong enough to cut out a chicken back without hesitation, they're sharp enough to snip chives as cleanly as any pair of shears could ever hope to, and they come with all the accoutrements a good pair of kitchen shears should (even if you never use half these things): bottle opener/lid lifter, flathead screwdriver head, nutcracker, jar opener, bone notcher, and more. Plus, they come apart at the hinge, allowing you to clean them thoroughly all over. While Kai's Kitchen Scissors don't sport the full array of functions that our favorite pair does (read: no bottle opener, nutcracker, or other multitool-like features), they're still a worthy pair. Well built, sharp, and successful in all our tests, they'll do most jobs with ease. They also come apart at the hinge, making cleaning easy. A great pair of kitchen shears should be, first and foremost, a great pair of shears. They should cut paper—whether parchment in the kitchen or an eviction notice you want to shred—with the silent grace of a razor. They should bust through stubborn plastic packaging before you give up all hope and try to tear at it with your teeth. They should be deft and accurate, remaining on track as you snip or slide them across an unfurled roll of wrapping paper (surely I'm not the only one who wraps presents in the kitchen, right?). Beyond that, they should be equally adept at kitchen-specific tasks. They should crack through poultry bones without getting stuck. (At least, they should for small birds; for larger ones, like turkeys, get yourself some good poultry shears.) They should snip delicate herbs and lettuces without juicing them in the process—unless wheatgrass shots are your thing, in which case I can't help you. Because kitchen shears will, at least occasionally, cut through foods like raw chicken, they should also come apart at the hinge, allowing for truly thorough cleaning. A pair that doesn't will eventually accumulate some funky gunk, and no one wants that, especially if it's teeming with salmonella. They should also be comfortable, with enough space in the handle loops for all the digits on a hand—it takes some pressure to spatchcock a chicken, so you'll want to recruit your whole hand's strength to do it. Kitchen shears that are uncomfortable to hold or have small handles do no favors for anyone. On top of that, as a southpaw, I will argue with conviction that good shears should work just as easily in the left hand as the right. Last, a truly useful pair of shears will have other tools built into them, kind of like a multitool. A bottle opener is always good to have, as are grips that can help twist off a stuck jar lid. A nutcracker is less likely to come in handy, but it doesn't hurt (and can be used to crack shells on a lobster or crab). I've only once put the screwdriver tip on one pair of multitool-like kitchen shears to use, but when I did, man, was I glad it was there, even if it is more awkward to use than an actual screwdriver. As for the bone notcher* some shears come with, I have yet to really find a need for it in my cooking, but it does no harm to have it there, so...why not? * It took me a long, long time to figure out how the bone notcher is even supposed to work. Here's how: The notch is meant to hold a slippery bone in place, allowing you to cut through it without the bone doing that frustrating thing where it slides along the scissors' blades as they press together, eventually escaping at the tip. Turns out, it's also useful for cutting the stems off a bouquet of flowers, which are also prone to that annoying slide. To find the best kitchen shears, I put 12 pairs through a series of tests. I started with the most difficult task—spatchcocking a chicken—to eliminate weak links quickly. From there, I moved on to subtler tests, like mincing chives and cutting parchment paper. To narrow down the field even more, I considered comfort level and details like take-apart hinges. Cutting the backbone out of a chicken is one of the more difficult tasks for a pair of kitchen shears, since it involves cleaving through a series of bones. If you're going to do this a lot, especially with larger birds, like turkeys, you're better off getting a pair of poultry shears, which are specially designed just for this task. But for most home cooks, a good pair of kitchen shears should be able to get the job done with ease. This seemed like as good a place as any to start my tests, since any pair that choked would be quickly disqualified, allowing me to rapidly narrow the field. I wasn't wrong: Five pairs hit the trash heap after snagging their blades on my test chickens. In some cases, they could hardly complete the task; in others, they did it, but not easily. With my remaining roster of shears, I moved on to the next test. Let's be honest: There's only one kind of tool that can really do a restaurant-quality job of mincing chives, and that's a gleaming-sharp knife. If you're taking a pair of kitchen shears to your chives, you've already thrown in the towel. But that's what makes this such a good test. If any pair of shears could do even a halfway decent job of snipping chives without bruising them beyond recognition, it would already be far ahead of the pack. Just to be safe, before proclaiming the chive test a done deal, I ran all the shears that had survived the chicken test through this test as well. The goal: cut large sheets of commercial-hotel-pan-sized parchment paper into smaller ones that could neatly fit into a half-sheet pan. I did this test both by snipping across the paper and by running the shears across with no snipping motion at all, the latter to see how well the blades themselves could slice through it. The better shears made clean, straight cuts and stayed on path with ease. Even when I slid them across the parchment, they slit it in a perfect, straight line, with little more than a whisper. The bad ones went hither and thither (such is the result of a bad pair of scissors!). Sliding across the parchment, they snagged and tore, paper fibers screaming as they were brutally ripped apart. As it turned out, all the scissors that did well in the chive test were the same ones that aced this test. The losers' disqualifications were confirmed. Now down to a list of four pairs of shears, I needed to find a way to narrow my selection further. The hinge was the deciding factor. Some kitchen shears are built like traditional pairs of scissors, with a bolted hinge permanently holding the two sides together. This can be a problem when you're using the shears to cut raw chicken and other foods: Any liquids that work their way into the interface where the two blades meet and pivot are trapped by the hinge and can't easily be washed away. A better design is an unlocking hinge: Open the shears wide enough, and the two blades come apart. This allows for a thorough cleaning of all surfaces of the scissors; simply dry them well before locking them back together, to avoid rusting. I decided to disqualify any pair of my remaining group that didn't offer this come-apart functionality. A clean pair of kitchen shears is essential. Throughout my testing, I evaluated the comfort of each pair of shears. I have fairly normal-size hands for a man, so if I had trouble squeezing my fingers into the handles of a pair of shears, that meant they'd be a problem for a decent chunk of other people. And larger handles are better with kitchen shears, since heavier-duty tasks are much easier to accomplish if you can use the strength of your entire hand and all its fingers, not just the few you can squeeze through the loop. I also noted which kitchen shears had flimsy handles—it can save a company money to skimp on the stainless steel by not having it extending all the way through. A lack of metal support in the handles means that more fragile plastic or rubber can collapse and bend under pressure, as some pairs did when I attempted to spatchcock a chicken with them. One final consideration was the extra features packed into the pair of shears. While not essential, it can be helpful—especially in a kitchen, where there's such a diversity of potential tasks—to have a built-in bottle opener, nutcracker, jar-lid opener, and more. I didn't consider a lack of these features to be a deal-breaker (our second-favorite pair lacks them), but in the event of a tie, their presence was the deciding factor. Our winning shears aced all the tasks I put them through with ease, from heavy-duty ones, like cutting the backbone out of a chicken, to delicate ones, like snipping chives without inflicting excessive damage on the tender green shoots. Both pairs have a take-apart hinge for thorough cleaning; a solid, quality stainless steel construction; comfortable handles; and a build that works just as well in the right or left hand. Our two top picks did equally well in all the tasks, so the deciding factor for our favorite pair came down to the extra features packed into it. Kershaw's Taskmaster Shears are the Swiss Army knife of kitchen shears, sporting a bottle opener, jar-lid lifter, jar-lid opener (grippers built into the handles that provide traction for twisting a stubborn lid off), flathead screwdriver heads (one on each handle), a nutcracker, and a bone notcher. This isn't the only pair of shears on the market to offer those features, but it's the one that has them and still performed the best in all the tests we ran. It has handle loops that are large and comfortable enough to fit most hands, and a take-apart hinge for thorough cleaning. On top of that, it worked just as well in my left hand as in my right, making it a pair of shears anyone can use. Kai's kitchen shears are a quality pair with a minimal design. While they lack the bonus features of our winner (no bottle opener or nutcracker in sight), they still came out on top, matching our winning pair in all our performance tests. It's a solid pair of shears with large, comfortable, and sturdy handles and sharp blades that made quick work of all the challenges we presented to it. It also works equally well in right and left hands, making it a great pair of scissors for just about any scissors-specific task. Messermeister's 8-Inch Take-Apart Kitchen Scissors had long been my favorite pair, as it offers all the built-in features of this review's winner. But it didn't perform nearly as well in the chicken-spatchcocking test, earning a disqualification at that early stage. The J. A. Henckels International Kitchen Shears performed fairly well in the chicken test, but didn't snip chives as well as they could have. Wüsthof's 5558-1 Come-Apart Kitchen Shears lost its bid at being the best shears early on, failing to perform well in the chicken test. The MAIRICO Ultra Sharp Premium Heavy Duty Kitchen Shears seem, based on their recognizable looks alone, to be a pair made by a single factory and sold under a wide range of brand names. No matter; it didn't cut the chicken backbone out well (and presumably none of its clones under other names would either). Kuhn Rikon's Classic Snips are a compelling pair with a lot going for them: They're sharp and well designed, and they performed well in all the tests. They have a spring-loaded hinge that makes their action appealing and snappy. They're a worthy pair, but ultimately didn't make the list of winners because their more complex hinge design means cleaning them fully of chicken fluids is that much more difficult. The kitchen shears from Tojiro-Pro look like one of the higher-end pairs of shears, with a heavy stainless steel build that just screams "quality." But whatever they offer in build quality, they lack in usability: The handle loops are too small, and the all-metal design is uncomfortable on the fingers. The Miyabi Kitchen Shears passed all our tests with fairly good performance, but were ultimately disqualified for lacking a take-apart hinge. OXO Good Grips' Multi-Purpose Kitchen & Herbs Scissors fell short on the chive-snipping test. Another pair offered by OXO, the Flexible Kitchen Herb and Household Scissors, was quite nice in many respects: It's sharp and deft, and, despite its small size, it managed to snip out the chicken back. These scissors have much smaller, thinner blades than the other scissors in this review, making them less adept at heftier tasks overall. If you wanted a second pair of kitchen shears for more delicate tasks, these would be worth considering. But we ultimately couldn't figure out why you'd want a second pair when our two winners did everything so well. KitchenAid's Classic Shears With Soft Grip were disqualified during the chicken-spatchcocking round.